This year, Global Recycling Day is on Monday, March 18th. 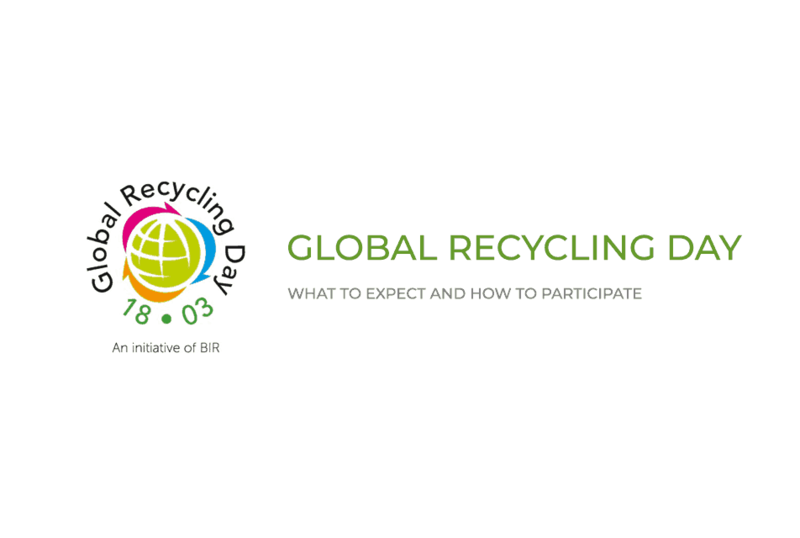 First launched in 2018, this annual global event aims to promote recycling and the recycling industry across the world. Raising awareness, the event showcases recycling’s vital role in preserving the future of the planet. With the amount of waste that still aren’t recycled around the world, youths, teachers, and families are encouraged to think differently about recycling. By thinking of recycling as a valuable resource, people would recycle more in their lives. Global Recycling Day wants people to realize that recycling is an important resource. It is as important, if not more, than water, air, oil, natural gas, coal, and minerals. These other resources risk being used up since they’re finite. A renewable resource like recycling supports local jobs and combats climate change. And as its name suggests, recycled materials can be recycled over and over again. Because of the value recycling brings, the event wants to recognize recycling as an important resource that needs investing by countries around the world. Even as we practice recycling, there is still so much waste being produced that aren’t recycled. You’d be surprised to see how many cities or countries that don’t commit to three-stream garbage collection. How many cities don’t take organics and convert them into biofuel. How many landfills that produce biogas that aren’t converted into energy. Ending waste requires thinking creatively and critically about recycling. What can we recycle? Or we ask ourselves: what can we do about plastic waste that are destroying our ocean and natural habitats? What can we do with hard to recycle items like large furniture and mattresses? Again the question is there, but not enough people are taking the effort to reduce these kinds of waste. Therefore Global Recycling Day wants to address recycling as a resource to help businesses, institutions, and people invest in recycling. So what can you expect for Global Recycling Day 2019? This year, the event focuses on educating youths about the power of the Seventh Resource. The event provides information for teachers and educators to use in classrooms. What else will happen on March 18th? You’ll see the hashtag #recyclinggoals trend online. The second part of the Global Recycling Day campaign revolves around using the sport of football (soccer) a global sport, to communicate recycling. The challenge is fun — it encourages youths and adults alike to place a recycling bin by a football (soccer ball) net on the field. Then it encourages the challenger to take a video of them reciting their recycling goal pledge, nominate a friend or family member, and then take a shot with their football (soccer ball). After that, the challenge suggests sharing the video online. Challenge friends and family to set their own #recyclinggoal and take the pledge. If pledging to a social media challenge is not your thing, that’s okay! The Global Recycling Day event also gives several activities for educators to do at school. 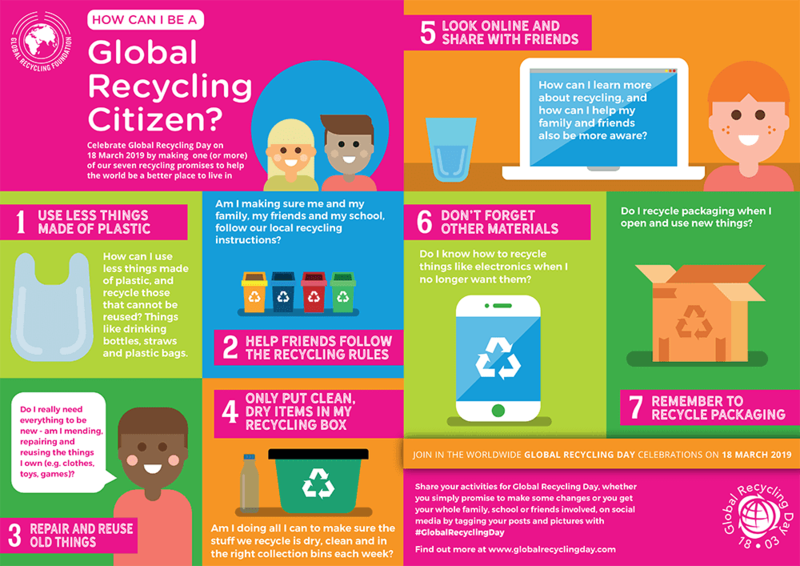 From organizing a litter pickup around the school to getting them to wear green in solidarity — the Global Recycling Day website has a lot of interesting event ideas to incorporate into your classroom. They also have lesson plans. Their recycling citizen graphics shows hot topics in the recycling industry. From single-use plastics to climate change and the circular economy, teachers can use the information to teach their students about recycling. Topics on their website include cool items made out of recycled materials and more. We hope you find this blog post helpful! Global Recycling Day takes place all day March 18th, 2019. It is an annual event that aims to educate and spread awareness about the importance of recycling as a resource. Now that you’re in the know, take to social media or in your class and join in on this important event! Canadian Mattress Recycling Inc. is Metro Vancouver’s leading mattress and furniture recycler. Since 2011, we have diverted over 25 million lbs of waste that comes through our doors. Recycling everything we receive, we work with the local community to help divert waste and improve the environment. We also enjoy supporting organizations and charities working nationally and globally to improve the world we live in.